The sensational Song Kang-ho pulls off on his greatest roles in The Show Must Go On, in which he plays a down on his luck gangster trying to do right by both his families, though he doesn't know that the odds are stacked against him. 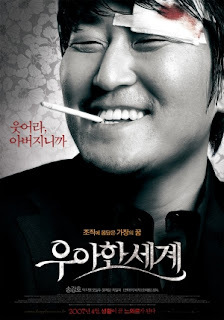 His scenes with Oh Dal-su (Oldboy and just about every Korean film you've ever heard of) are a marvel and the script is surprising and original. Song's character is faced with extraordinary decisions and changes a lot over the course of the narrative, only an actor of his caliber could convey the conflicts and transition so effortlessly. A superb film that needs more exposure.